Most of the commercially-produced apples, pears and sweet cherries in the United States are grown in Washington. Warm, even temperatures and plenty of water provide ideal conditions for commercial and home orchards, alike. Growing fruit trees is a long-term investment because most fruit trees take five years to produce plentiful harvests. Fruit trees, especially apples, cherries and pears, are prone to disease and insect infestation. Because Washington's economy is so dependent on its fruit sales, state law requires home fruit growers to manage diseases and pests effectively to avoid spreading them to commercial orchards. Consult a local county extension office for varieties adapted to Washington's cloudy weather. Choosing the appropriate variety is the number one factor in determining fruit growing success, according to Washington State University Extension Service. Buy healthy trees that stand at least 36 inches tall from reputable nurseries or garden centers. Look for green leaves and smooth, brown bark. Buy from a nursery that offers a one-year guarantee on their fruit trees. Dig a hole as deep as the root ball and twice as wide. Lay the soil on a tarp placed on the ground. Moisten the peat moss until it is wet, but not dripping. Add the peat moss and compost to the removed soil and mix with a shovel. Turn the pot on its side and tap on it to loosen the root ball. Hold the tree at the base of the trunk and turn the pot upside down with your free hand. Pull the tree gently from the pot. Set the tree in the hole so it stands 2 inches above the surrounding soil. Remove the tree and add more soil to the hole if necessary. Backfill the hole with the amended soil until half full. Fill the hole with water and allow it to drain. Backfill the hole completely full and tamp down gently to remove any air pockets. 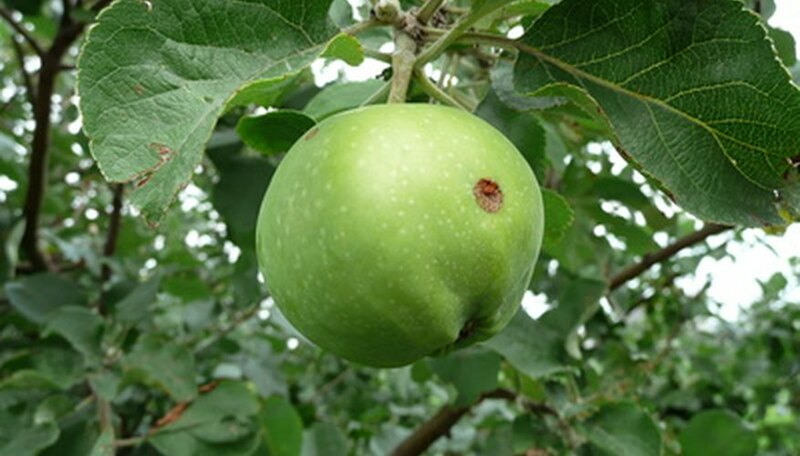 Fertilize the fruit tree three weeks after planting with a 10-10-10 granular fertilizer. Spread by hand on the ground in a circle around the tree, 3 inches from the trunk to 18 inches out from the trunk. Thereafter, apply 10-10-10 fertilizer in early spring at a rate of 1/2 lb. per 1 inch of the trunk diameter, measured 1 foot from the ground. Prune fruit trees in early spring while they are still dormant. Prune out any dead, diseased or crossing branches first. Then remove vertical branches that grow within 6 inches of each other and 2 feet of the main trunk. The goal of pruning fruit trees is to open up the canopy to light so that fruit ripens properly. Use pruning shears for limbs 1/2 inch in diameter or smaller. Use pruning loppers for branches 2 inches in diameter or less. Use a pruning saw for larger branches. 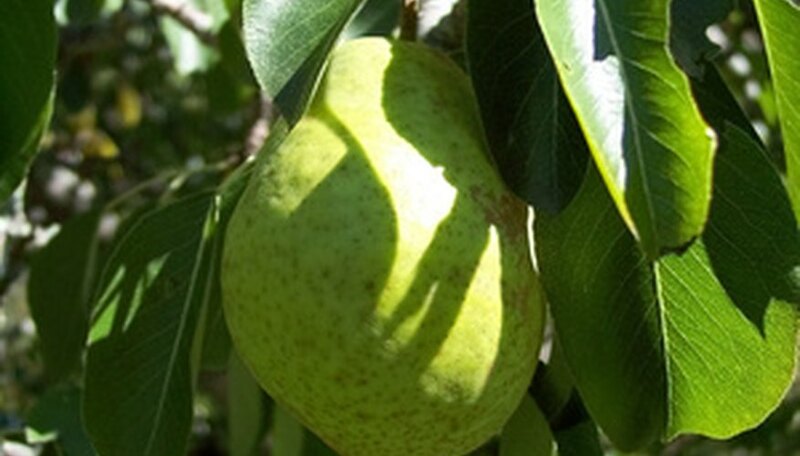 Water fruit trees weekly during dry weather, particularly three or four weeks before harvesting the fruit. In western Washington, you'll seldom need to provide additional water. 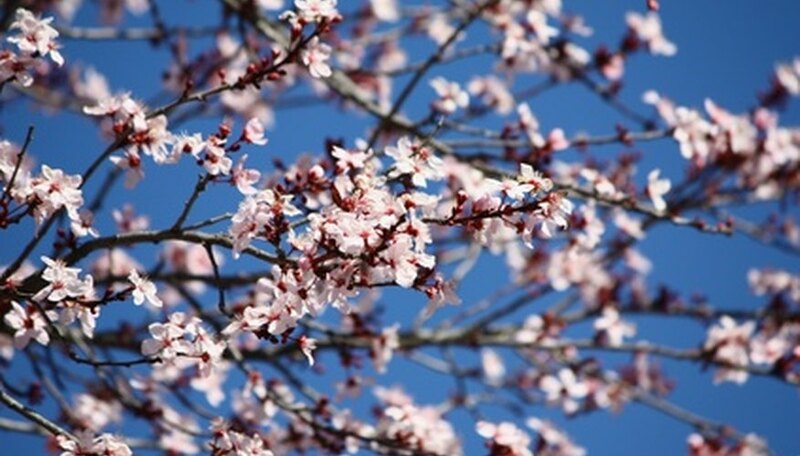 Spray trees in early spring with dormant oil spray and a fungicide if your trees are prone to pests and diseases. Consult a local extension office first to identify pests and recommend a treatment, as they vary depending on the location. Taste fruit to determine ripeness. Harvest pears while they are still slightly immature. Harvest other fruits when they taste sweet and juicy, with no woodenness. Store fruit at 32 degrees Fahrenheit. Use bruised or blemished fruit immediately for eating or for jams. Mulch fruit trees in eastern Washington where the weather is dry and winters are bitter. Apply 3 inches of wood chip mulch around the base of the tree and in a circle, 18 inches from the trunk. Mulch keeps the soil warm and moist and prevents heaving in the winter. Don't mulch in damp western Washington areas because you'll attract insects and voles. Clean up all fruit and debris at the end of the season to minimize the spread of disease. When pruning diseased limbs, dip your tools in a solution of 1 part chlorine bleach to 9 parts water to disinfect them. Consider growing apricots, peaches and plums instead of apples, pears and cherries. These fruits grow well in Washington and are less prone to disease and pests, requiring fewer chemicals. Always follow package directions on fertilizers and pesticides carefully. Work on a clear, dry day and store any unused chemicals away from children.